EU diplomats have participated in the PA's popular resistance events, finds Intelligence and Terrorism Information Center. Diplomats and parliamentarians, mainly from European countries, have actively participated in popular resistance events and activities initiated by Palestinian Authority Arabs in Judea and Samaria, a report released by the Meir Amit Intelligence and Terrorism Information Center (ITIC) has found. The report has found that in isolated cases, these European diplomats and parliamentarians also participate in activities on the ground which defy Israel. The report cited as an example the French diplomat who was documented as she physically attacked an Israeli soldier during a demonstration in support of illegal Bedouin squatters. The popular resistance, noted ITIC, is a strategy supported by the PA and the Fatah faction headed by Mahmoud Abbas. It includes violent activities such as the destruction of fences, confrontations with IDF soldiers, throwing stones and firebombs and in certain instances, carrying out vehicular and stabbing attacks. ITIC has discovered that the Eighth Bilin International Conference for Popular Resistance, which was recently held and discussed ways and means to encourage the popular resistance, was attended by John Gatt-Rutter, the EU's representative in the PA and by Sir Vincent Fean, the British consul-general in Jerusalem. Previous Bilin conferences were also attended by Luisa Morgantini, a member of the European Parliament and a Nobel Peace laureate, who is hostile to Israel, noted the center. Bilin is one of several hotspots in Judea and Samaria where Arabs, radical leftists and anarchists engage the IDF and Border Police in clashes every Friday, for the purpose of disseminating propaganda footage to the world. The demonstrators regularly initiate violence during these protests, injuring soldiers who attempt to use non-violent means to disperse them. 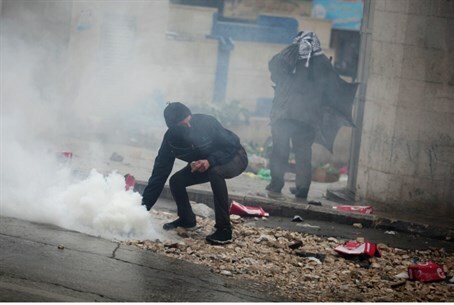 It has been reported that protesters in Bilin earn money from international leftists for throwing stones at soldiers. In its report, ITIC also noted that the PA and Fatah encourage European diplomats and anti-Israeli activists to participate in popular resistance events. They regard their involvement as a tool for enhancing the legitimacy of the popular resistance, as a way of making it difficult for Israeli security forces to respond to illegal activities and a means of exerting international diplomatic pressure on Israel, especially pressure from European countries. According to ITIC’s assessment, the diplomats’ participation is limited and does not reflect the general conduct of European diplomats in Israel or the PA. However, in those cases in which they do participate in popular resistance events, whether at the Bilin conferences or activities on the ground, such involvement is exceptional behavior with regard to accepted diplomatic practice. Such involvement may create difficult situations for the IDF (such as the event in the northern Jordan Valley) and reflect badly on Israel in the international arena, especially in European countries, noted ITIC. Previous Bilin conferences, the report said, were attended by diplomats and foreign parliamentarians. For example, the fifth conference (held April 21-23, 2010) was attended by members of parliaments who gave speeches, and communiqués were read from Desmond Tutu and former U.S. President Jimmy Carter. Among the participants in that conference, prominent were Robert Serry, the UN special coordinator for the Middle East, and Morgantini. Morgantini also attended the seventh conference (held April 10-13, 2012), which passed resolutions calling for strengthening the popular resistance and increasing coordination between Palestinian Authority Arab institutions and legal bodies in the United States and Europe. ITIC further noted an incident on June 14, 2013, when Sir Vincent Fean, the British consul-general in Jerusalem, and Alistair Burt, the British minister for the Middle East and North Africa, paid a visit to the village of Nabi Saleh (northwest of Ramallah), another hotspot of weekly protests by Arabs, to express solidarity. According to ITIC, the two met with Naji al-Tamimi, the Nabi Saleh coordinator for the Popular Committees Against the Fence and Settlements, who in the past was detained by the Israeli security forces for participating in riots. They toured the village and inaugurated a building renovated by the British consulate in Jerusalem. After the visit, said the report, Burt said that he felt proud to return to Nabi Saleh and that the village was very significant for him. He said it was his third visit and every time he came he was surprised by the villagers' determination. He said the al-Tamimi family represented “the thousands of Palestinian families in the occupied territories suffering directly from the occupation.” ITIC cited the Arabic Facebook page of the British Consulate in Jerusalem as having carried Burt’s comments.